A couple of easy scarf knitting patterns are posted here for you. One is a modern three way hooded scarf that is ever so attractive. The other is a vintage pattern that is just as nice today as it was back than. I have to admit, as for hand knitting I am a lazy knitter. I prefer to knit with the larger needles and chunky yarn. I do love the look of the tiny-needled projects but I just don't have the dexterity I use to have. So I use the bigger supplies now. This doesn’t really limit what I make it just speeds it up. I still make scarves and I think the vintage pattern below is a great example of what can be accomplished with just a bit of imagination. I also enjoy creating scarf knitting patterns . Designed by Mary Jane Protus. Scarf measures approximately 7" wide X 36" long. RED HEART® Ltd. “Foxy”, Art. E724, 100% Polyester (50g / 1.76 oz / 82m / 89 yard ball): 2 Balls No. 9996 Bluesy. Circular Knitting Needle: 9mm [US 13] – 29". Stitch marker; yarn needle; fabric glue. GAUGE: The stitches are loose on the large needles and the gauge will vary as the knitted tube is pulled lengthwise to be worn as a scarf or the tube is opened up and the fabric is pulled width-wise to be as a hood or poncho. Cast on 60 stitches loosely; join in a cir­cle to work in rounds, taking care that stitches are not twisted. Place the stitch marker between first and last stitches to mark beginning and end of rounds. Knit every round until all but 6 yards have been used. K1, * yo, slip the K st over the yo, K1, slip the yo over the K st; rep from * around; yo, slip the K st over the yo. Fasten off. Weave in ends on the wrong side. Apply a dab of fabric glue to woven area and allow to dry; trim ends. ABBREVIATIONS: K = knit; m = maille(s); mm = millimeters; st = stitch; yo = yarn over; * = repeat whatever fol­lows the * as indicated. Scarf knitting patterns "Free scarf pattern" A couple of easy scarf knitting patterns are posted here for you. One is a modern three way hooded scarf that is ever so attractive. The other is a vintage pattern that is just as nice today as it was back than. More Free Knitting patterns Baby & kids knitting patterns – yours free! Download Today! I have to admit, as for hand knitting I am a lazy knitter. I prefer to knit with the larger needles and chunky yarn. I do love the look of the tiny-needled projects but I just don't have the dexterity I use to have. So I use the bigger supplies now. This doesn’t really limit what I make it just speeds it up. I still make scarves and I think the vintage pattern below is a great example of what can be accomplished with just a bit of imagination. I also enjoy creating scarf knitting patterns. 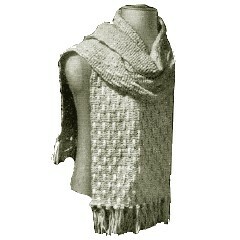 Easy knitting pattern Three Way Scarf Knitting Patterns Designed by Mary Jane Protus. Scarf measures approximately 7" wide X 36" long. RED HEART® Ltd. “Foxy”, Art. E724, 100% Polyester (50g / 1.76 oz / 82m / 89 yard ball): 2 Balls No. 9996 Bluesy. Circular Knitting Needle: 9mm [US 13] – 29". Stitch marker; yarn needle; fabric glue. GAUGE: The stitches are loose on the large needles and the gauge will vary as the knitted tube is pulled lengthwise to be worn as a scarf or the tube is opened up and the fabric is pulled width-wise to be as a hood or poncho. Cast on 60 stitches loosely; join in a cir­cle to work in rounds, taking care that stitches are not twisted. Place the stitch marker between first and last stitches to mark beginning and end of rounds. Knit every round until all but 6 yards have been used. Note: An easy hooded scarf knitting pattern. Making this up into a hooded scarf is pretty easy. Just knit as described in the pattern. Than when complete, fold in half, stitch down about 12 inches from fold on one side. There you have a very nice hood scarf. Work at a tension to produce about 6½ stitches to the inch. Cast on 59 stitches (for a 9 inch width). 1st row: K.5, *wool forward, K.2 together, K.4, repeat from * to the end of row. 2nd row: K.5, *P.1, K.5, repeat from * to the end of the row. Repeat the last two rows twice. 8th row: Like the 2nd row. 9th row: K.2, *wool forward, K.2 together, K.4, repeat from * to the last stitch, knit this. 10th row: K.2, P.1, *K.5, P.1, repeat from * to the last 2 stitches, knit these. Repeat the last 2 rows twice. 16th row: Like the 10th row. Repeat these 16 rows until the Scarf measures 50 inches, or the required length. Add a fringe to each end. From: Woolcraft: A Practical Guide to Knitting and Crochet, first published in 1915.